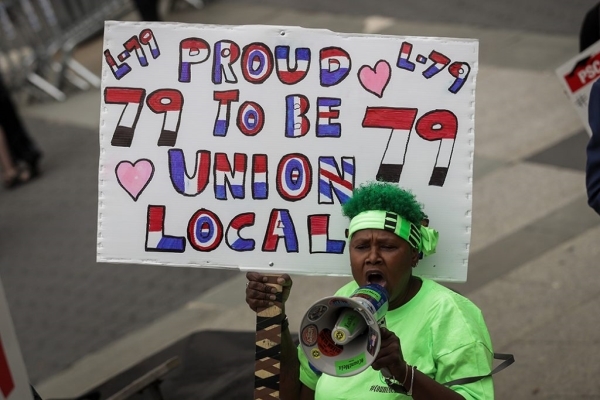 Unions help increase the wealth for all workers, but new research from the Center for American Progress shows that unions boost wealth the most for families of color, narrowing the racial wealth gap. Using data from the Federal Reserve’s Survey of Consumer Finances, CAP found that union members have greater wealth than nonmembers, and the difference is much larger for nonwhites than whites. From 2010 to 2016, nonwhite families who were also union members had a median wealth that was almost five times—485.1 percent, to be exact—as large as the median wealth of nonunion nonwhite families, according to CAP’s analysis. The difference between union and nonunion white families was much smaller, with the former having a median wealth that was only 139 percent that of the latter during that period. The research released today uniquely focuses on race, union membership, and the accumulation of wealth, while the majority of research conducted by others in this area focuses on how income or wages are affected by race and union membership. Wealth is particularly important to study because it is critical to families’ immediate and long-term economic well-being. It helps families pay their bills if their income drops due to unforeseen events such as a layoff or medical emergency. It also allows them to invest in their future by sending their children to college; moving to a desirable neighborhood due to, for instance, better schools; switching jobs; or starting a business. Union members of all races have higher earnings, more benefits, and more employment stability than nonunion members. Union members’ total annual earnings are between 20 percent and 50 percent greater than those of nonunion members. Being a union member creates a number of venues for workers to build more wealth than would be available for nonunion members, CAP’s issue brief notes. Union members bargain collectively for wages, benefits, and procedures that affect their employment, and as a result of being covered by a collective bargaining agreement—the contract that employers and unions regularly sign and that governs these employment-related issues—union members have higher wages, on average; more benefits; and more stable employment than is the case for nonunion members. Higher wages then translate into more savings in absolute terms, as well as more tax incentives to save; more job-related benefits—such as health insurance, defined benefit plans, and life insurance—mean that union members need to spend less money than do nonunion members to protect their families against future income losses. Therefore, union members can save more money to pursue their own goals, such as paying for their children’s college education. Lastly, union membership leads to greater employment stability and job protections that translate into longer tenures with one employer. This employment stability translates into more savings, as union members are more likely to be eligible for key benefits such as retirement savings and can better plan for their futures. Click here to read “Union Membership Narrows the Racial Wealth Gap for Families of Color” by Christian E. Weller and David Madland.